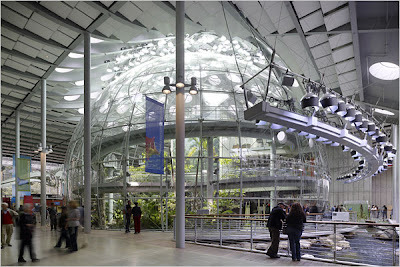 The new building for the California Academy of Sciences was designed by Renzo Piano (whose building for the new contemporary wing of the Art Institute of Chicago is just being completed here). I'm not generally a huge fan of his work, but this building is a breathtaking work of subtle genius, which lovingly and subtly interweaves indoor and outdoor space, fusing the natural with the built environment. 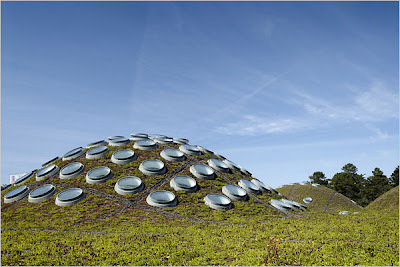 Those who enjoyed my post on green roofs in architecture, will love the green roof on this one...one of the most interesting I've seen. 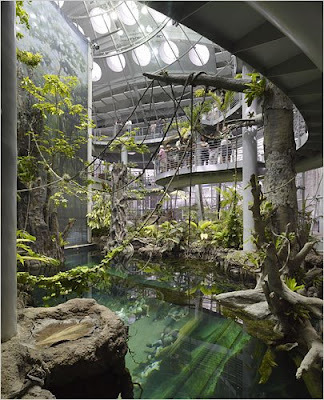 Nicolai Ouroussoff writes for the New York Times: "If you want reaffirmation that human history is an upward spiral rather than a descent into darkness, head to the new California Academy of Sciences, in Golden Gate Park, which opens on Saturday. "A glass lobby allows you to gaze straight through the building to the park on the other side. 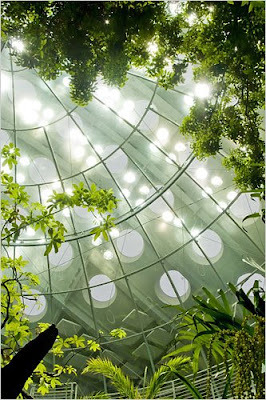 Other views open into exhibition spaces with their own microclimates. 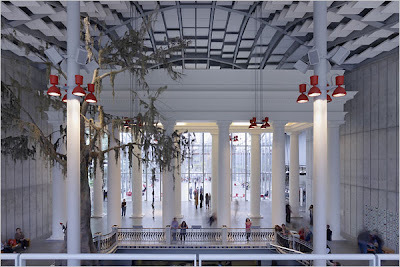 The entire building serves as a sort of specimen case, a framework for pondering the natural world while straining to disturb it as little as possible." "The roof of the academy’s lobby, supported by a gossamerlike web of cables, swells upward as if the entire room were breathing. Views open up to the landscape on all four sides, momentarily situating you both within the building and in the bigger world outside. A narrow row of clerestory windows lines the top of the lobby. One of the building’s many environmental features, these windows let warm air escape and create a gentle breeze that reinforces the connection to the natural setting." 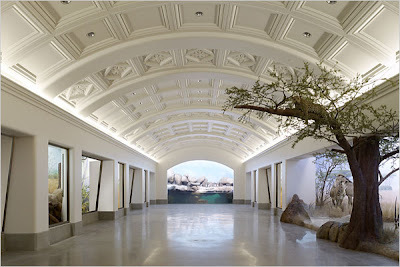 "The museum has also preserved its African Hall, with its gorgeous vaulted ceiling and dioramas of somnolent lions and grazing antelopes, integrating it into the new design. Built in the 1930s, this neo-Classical hall is a specimen of sorts. Its massive stone structure reflects colonial attitudes about the civilized world as a barrier against barbarism. It was intended as a symbol of Western superiority and a triumph over nature." "By contrast, Mr. Piano’s vision avoids arrogance. The ethereality of the academy’s structure suggests a form of reparations for the great harm humans have done to the natural world. It is best to tread lightly in moving forward, he seems to say. This is not a way of avoiding hard truths; he means to shake us out of our indolence." Wow, very natural, simply nice work.